Have you been thinking of investing in a garage or workshop to indulge in your favorite hobby? Maybe you’d love to have your own private space to engage your inner artist, build woodworking projects, work on your hot rod, or get the garden started before the spring season. Have thoughts of winter’s cold, dark days stopped you in your tracks? The truth is that utilizing your garage or workshop in the winter is one of the best ways to combat cabin fever and while away those dark, cold days doing something you love. You just need to find a way to make your garage more comfortable during those cold months. Fortunately, there are simple and even inexpensive ways to heat your garage or workshop all winter long. Whether you’ve had a garage for years, or you’re thinking about building one in the near future, here are some tips to keep your favorite space cozy and comfortable this winter and beyond. Adding insulation is one of the easiest ways to keep your garage warmer this winter. Insulation acts as a protective barrier, keeping cold air outside and heat inside. There are many types of insulation from standard fiberglass and cellulose insulation to rigid foam sheets and spray insulation. The most important thing to keep in mind, though, is sealing holes and crevices that allow air to penetrate the space. Before you install insulation, be sure to fill all holes and gaps, particularly around windows and garage doors, with a low-expanding spray foam. Adding insulation is an easy job for most do-it-yourselfers, and remains one of the most inexpensive ways to keep your garage or workshop more comfortable year-round. Of course, if you live in an area that regularly drops below freezing throughout the winter months, insulation alone won’t be enough to keep you warm. You’ll also need to add some heat as well. One of the simplest ways to heat your garage during the winter months is to use a portable heater made to heat large spaces. You’ll find a wide selection of portable heaters at your local big box store, from plug and play electric space heaters to combustion heaters that burn either kerosene or propane to produce heat. The type of space heater that’s best for you will depend on a number of factors such as the size of your space, the amount of insulation you have, and how you plan to use your garage or workshop. Combustion heaters, as their name suggests, combust fuel to heat your space. The most popular combustion heaters use kerosene or propane for fuel. Both propane and kerosene heaters can heat spaces very quickly. However, you’ll need to provide sufficient ventilation to avoid the dangers of carbon monoxide. These heaters can also produce fumes and loud sounds that can be off-putting for some. Propane heaters, in particular can be very noisy, but they also provide a lot of heat to keep you comfortable for long periods. 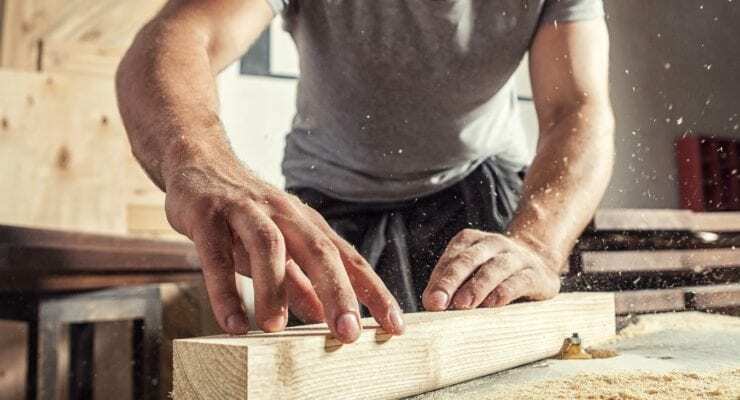 A word of caution: If you plan to do woodworking in your garage or workshop, be aware that saw dust and flammable vapors from stains and paints can cause potential safety issues. Be sure to check with the heater manufacturer before using propane or kerosene heaters in a woodworking environment. Similar to the space heater you might already use to supplement heat inside your home, electric space heaters are also available for larger areas like a garage or workshop. Electric space heaters are often safer to use than combustible models, especially in environments where combustion fumes would present too much risk. Plus, today’s more efficient electric space heaters won’t raise your electric bill significantly. However, electric space heaters often take a while to heat up your space, so you’ll need to turn them on and get your space warmed up before you’ll be completely comfortable. While they won’t work when the power is out, electric space heaters are simple, portable, and easy to use. Just plug them into an available outlet and go. Electric space heaters also work much better in smaller spaces or in spaces that are properly insulated. No matter which space heater option you choose, be sure that you turn off your space heater when leaving your garage or workshop. Leaving a space heater unattended can be dangerous, and running your heater when you don’t need it wastes money and energy. While it won’t be cheap, adding a dedicated heating system to your garage or workshop could be a great choice in the long run, especially if you plan for the installation when you’re building your new garage or working on an extensive remodeling project. Dedicated heating systems take the hassle and the wait out of indulging in your favorite hobby and make it much more likely that you’ll enjoy your space year-round. If you’re thinking of taking the plunge on a dedicated heating system, here are two of the most popular choices to consider. One of the most efficient heating systems for garages and workshops is in-floor radiant heating. These systems use a series of tubes, installed beneath the floor, to radiate heat to the floor’s surface. Heat from the floor radiates out into the rest of the room, creating even, comfortable heat with no hot spots. Radiant floor heating is extremely efficient and doesn’t cost much to operate once it is installed. It’s also very quiet. Of course, adding radiant heating is not a job for the do-it-yourselfer and should only be installed by a qualified heating contractor. The initial costs can be high, but compared to some systems, the advantages could outweigh the expense. Another heating system that has gained popularity in the last few years is the mini-split system. These heating systems include an air-handling unit installed in your garage or workshop, and a compressor which is installed outside. Mini-split systems are powered by electricity. Some systems provide both heating and cooling, which can be an advantage over other heating systems. Ductless systems offer lots of flexibility and can be installed along the floor, wall-mounted, or even suspended from the ceiling. Like radiant floor heating, mini-split systems must be installed by a qualified heating contractor. The upfront costs can be substantial, but getting both heating and air conditioning in one unit can be worth it. If you live in a very cold climate, mini-split systems might not provide all the heat you require. Be sure to discuss your needs with your heating contractor. As you can see, you don’t need to let the dark, frigid days of winter stop you from enjoying your favorite hobby. Adding insulation and a portable space heater may be all you need to stay cozy and comfortable in your garage or workshop all winter long. Of course, if you end up loving your new space, you might also consider more permanent heating options that can make it more convenient than ever to slip away to your own private sanctuary. No matter how you plan to heat your space, Newmart Builders can build the perfect garage or workshop for your needs. Check out our selection of attractive, durable metal garages and workshop spaces, custom-built for you without the hassles or time investment of traditional construction.